All smiles for Joey Whelan as he accepts his check. 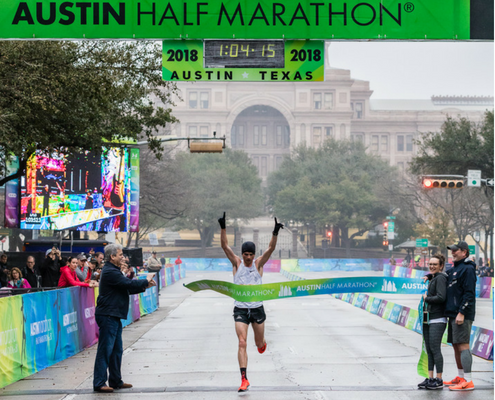 Runners accepted to the 2019 Austin Marathon/Half Marathon Elite Athlete Program will compete for a $20,000 prize purse. The Austin Marathon prize purse will total $15,000 and award the top five male and female finishers. The Austin Half Marathon purse will total $5,000 and award the top three male and female finishers. An additional $6,000 is up for grabs for elite milers in the Manzano Mile presented by Dole®. Applications will be accepted on a rolling basis until December 31, 2018. Patrick Smyth misses the half marathon OTQ B standard by 16 seconds. 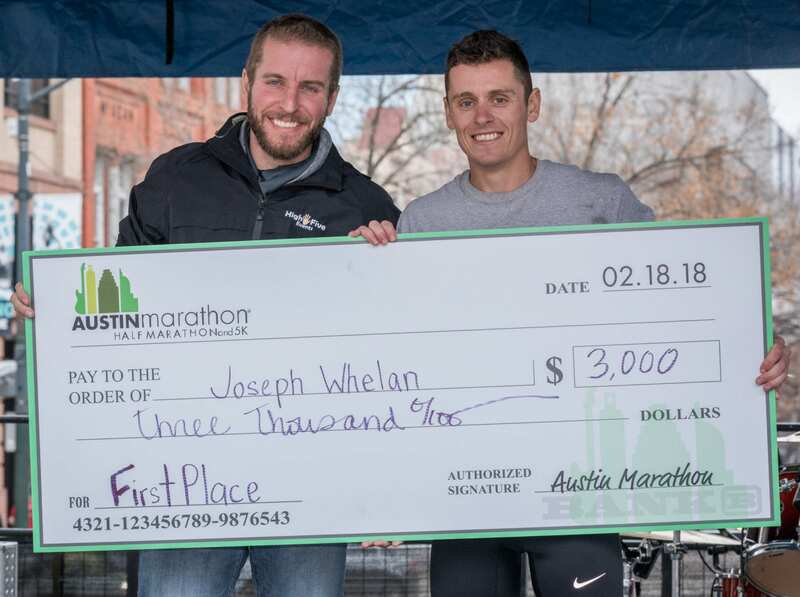 Joey Whelan (2:21:37) and Austinite Allison Macsas (2:43:11) both won the 2018 Austin Marathon. 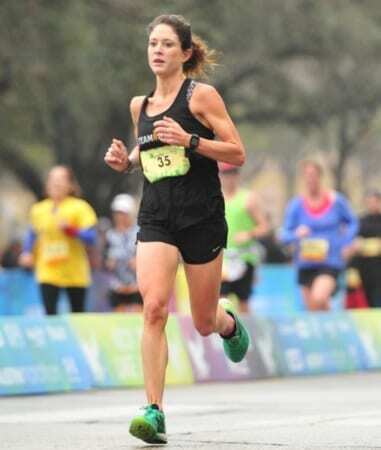 Macsas won her second Austin Marathon title in a row and qualified for the 2020 Olympic Marathon Trials. Patrick Smyth (1:04:16) and Hillary Montgomery (1:16:15) won the Austin Half Marathon. Smyth barely missed out on an Olympic Trial Qualifying time. Review last year’s marathon and half marathon times. Athletes accepted into the Elite Athlete Program must meet the program’s standards. Those that meet standards will receive a comped entry, standards bonuses, comped entry to the 3M Half Marathon, and be eligible for hotel and transportation reimbursement up to $350. Runners could still be accepted into the Elite Field if their times fall within a 10-15 minute window of Program standards. They would receive a comped entry only. To be eligible for reimbursement athletes must be accepted into the Elite Athlete Program and start the race. All athletes are subject to random drug testing pre- and post-race. Read more about program details, including eligibility standards, here. Interested athletes with questions can contact elites@youraustinmarathon.com. Apply to run with the 2019 Austin Marathon elites! The Manzano Mile presented by DOLE® will take place on Saturday, February 16th, during Austin Marathon weekend. Dole Packaged Foods’ return marks the second year of the $6,000 prize purse, continued race-day support, and increased involvement with the popular mile-long race. Registration opens Monday, July 30, 2018. Participants can register for the timed mile for $30. It will cost $10 for the Future Milers of America (9 and under). Current Austin Marathon and half marathon registrants will receive a 50% discount when they add the Manzano Mile during their registration. Participants can register, read Manzano Mile details, and review prize purse breakdown on the Mazano Mile webpage. The event will begin at 11:00 a.m. and take place entirely on Riverside Dr. The course is next to the Health and Fitness Expo at Palmer Events Center. Participants will receive a bib and a Manzano Mile race shirt. Packet pick up will take place on-site and begin Saturday at 9 a.m.
Last year’s male elite field created a buzz with their photo finish. Daniel Herrera (4:11.35) crossed first. Yasunari Kusu (4:11.69) and Dylan Blankenbaker (4:11.84) took second and third. Dana Mecke (4:47.08) finished as the first elite female. Austinites Jennifer Hall (4:51.72) and Mary Beth Hamilton (4:56.67) rounded out the elite female field. The Austin Marathon will celebrate its 28th year running in the capital of Texas on February 17, 2019. Austin’s flagship running event annually attracts runners from all 50 states and 30+ countries around the world. Having start and finish locations just a few blocks apart, being within walking distance of many downtown hotels and restaurants, and finishing in front of the picturesque Texas State Capitol makes the Austin Marathon the perfect running weekend destination. Participants can register for the Austin Marathon, Austin Half Marathon, Austin Marathon 5K, Manzano Mile, or the Austin Marathon VIP Experience. Manzano is a highly decorated track star, four-time USATF National Champion, seven-time Team USA member, two-time Olympian, and silver medalist in the 1500m at the 2012 Olympic Games. He was the first American to medal for USA in the 1500m since 1968. Manzano attended Marble Falls High School where he was a nine-time Texas 4A State champion in track and cross country. Manzano was accepted to The University of Texas and won five NCAA National Championships and was a nine-time All-American. You can buy your 2019 Austin Marathon, Half Marathon, and 5K photos now at a discounted rate! Let our official photo service, FinisherPix, takes care of your personal race memories. Photos are taken using only professional equipment in high quality. FinisherPix processes your race photos on the spot, which allows us to get photos online quickly. Photos are normally available within 24-48 hours after the event. Use the links below to pre-purchase your race photos at a discounted rate. This pricing is only available for pre-purchase. After February 16th, prices increase.